There was more than a hint of glamour at the recent press conference, for the upcoming Mark Lyons and Billy James-Elliott promoted LORDS OF THE RING II event, which took place at The Square Pie in Spitalfields Market, as all three female boxers that will be taking part were in attendance, along with other boxers that will be competing at this historic event. 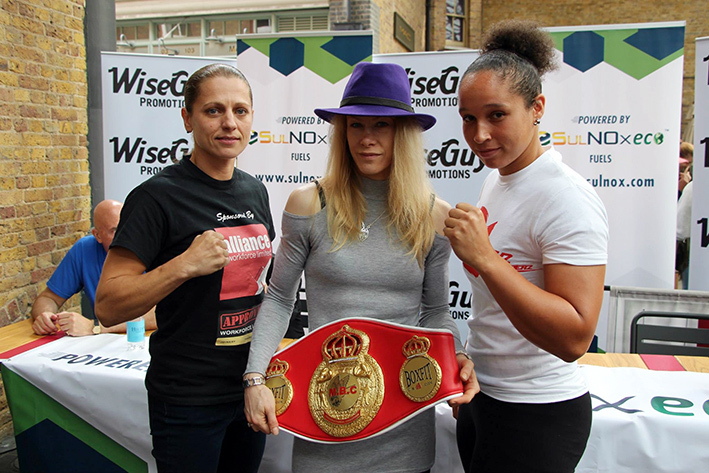 LORDS OF THE RING II has secured it’s place in the history books of the sport as this will be the first professional boxing event, in the UK, to feature three female combatants. The first to speak was Team GB athlete Shaunagh Brown, from Peckham, London, a successful athlete in three disciplines, Shot Putt, Hammer Throw and Discus, who makes her professional debut on August 29th. “I’m excited to be making my pro debut next week, I can’t wait. I’ve always worked hard to prepare for a competition, but the work you have to do as a boxer is another level altogether. My coach Mark (former Commonwealth Champion Mark Reefer) has been brilliant, I’ve learned so much from him, he really has made this move from athletics to boxing much easier than it should have been. Next to speak was Leeds, Yorkshire’s Sam Smith, who recently beat Zsofia Bedo to secure the International Masters International title, on just her third professional bout. “It’s been a long journey to get here today but it’s been worth it, it’s been my dream to fight at York Hall one day and now I am. This has all happened so fast, I fought on August 2nd and was going to take a week off from training, but when Lee (former Irish Champion Lee Murtagh) said he could get me on the show that went straight out the door, I had to take it, so just took a couple of days off and then straight back in the gym to get ready. Finally British #1 and reigning MBC International Champion, Woolwich, London’s Marianne Marston took to the mike. 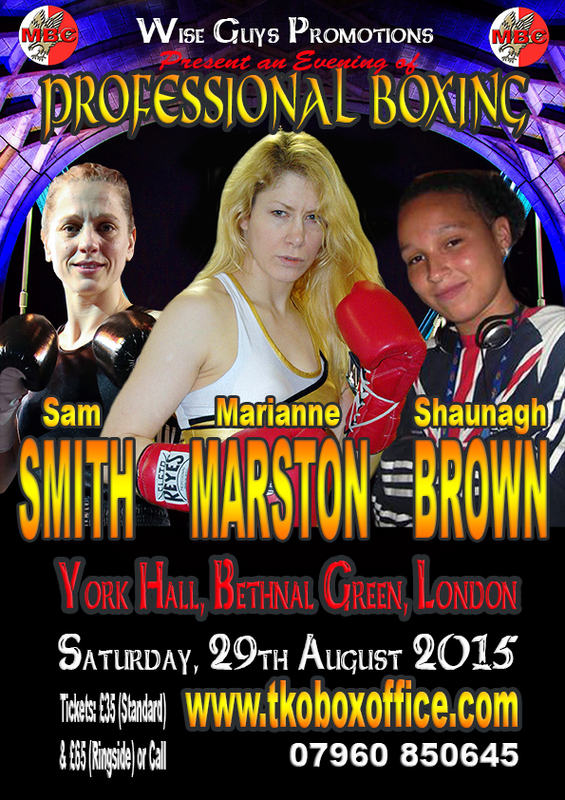 “I would not only like to thank Mark and Billy (promoters Mark Lyons and Billy James-Elliott) for giving myself the opportunity to fight on their August 29th show, but also thank them for unwavering support of Women’s boxing. It’s an honour to be involved in such an historic event, have to say though it’s been a rather long time coming. Everyone expected that Women’s boxing would take off here, after the success of the sport at the London 2012 Olympics, but it’s only now that it is, although saying that I must stress that this is only possible because of the MBC (Malta Boxing Commission), as they are the only pro organization operating in the UK that actively encourage and support Women’s Professional Boxing. Hopefully this is the start of big things for us, last year we had myself and Angel (McKenzie) fighting on the same show, now we have Sam, Shaunagh and myself all fighting on the same event, hopefully by this time next year we will create even more history with an all female event. I can’t wait to get back in the ring, it’s been nearly ten months since I last fought, which is way too long. I’m pleased to say that the injury that stopped me fighting earlier in the year is now healed, so I have been able to train fully for next Saturday’s fight. 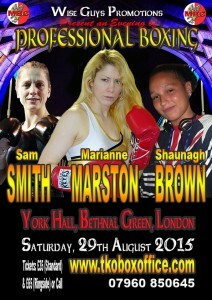 We’re all hoping that there will be some good support from the fans, not only is it the new season opener and the first chance to catch some boxing action in the Capital after the summer break, but also it’s the first time ever that there are three Women’s boxing bouts on a pro show. 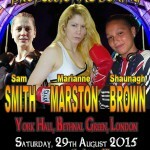 « Female Boxing: Marston, Smith and Brown In Action In London, Aug 29th.